George Kordas was born in Nikaia, Piraeus. He studied physics at the University of Erlangen in Germany specializing in nuclear physics. At the same University prepared the thesis at the Department of Materials Science and technology, specializing in ceramics and glass technology. After his military service he joint Vanderbilt University in the USA. He was Associate Quality Professor at the University of Urbana-Champaign in the United States. 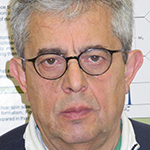 In 1990 he was appointed researcher at NCSR Demokritos. The 2015 founded the company nano4chem for the application of technologies developed at NCSR Demokritos. Was the main coordinator of the project funded by the European Research Council titled "nano-containers transporting drugs for targeted therapy of breast and prostate cancer" that achieve extremely topical chemotherapy of cancer. He also received by ERC a Proof of Concept Grant to prepare the formation of nano4chem, to develop a business plan, to submit a PCT and proof that the nano4Dox and nano4CS platforms perform better than Doxil and lipoplatin. Multi stimuli polymeric materials, organic and inorganic, are in the epicenter of scientific research due to their broad application especially in drug delivery systems for local drug administration. According to literature, different types of polymeric nanostructures are fabricated with different shape, size and material. Among them, liposomes, micelles, nanogels, nanoparticles, nanocontainers and nanotubes are the most known nanostructures in nanomedicine. Combination of the nanomaterial properties enhanced their applicability in diagnostic and therapeutic field. In this report, multi stimuli nanocontainers doped with iron nanoparticles and loaded with the traditional anticancer drug Doxorubicin were synthesized, characterized and investigated as for their induced cytotoxicity profile after activating with alternate magnetic field in MCF-7 cancer cells. In vivo hyperthermia treatment had also investigated.